During February 1986 a low pressure system parked itself off of the Northern California coast. This system, coupled with a stream of tropical moisture extending out past Hawaii and a jet stream aimed straight at the coastline, brought a powerfull string of storms over much of the northern part of the state. The storms caused major flooding across the region. - The Lookout Line was under water in several places. 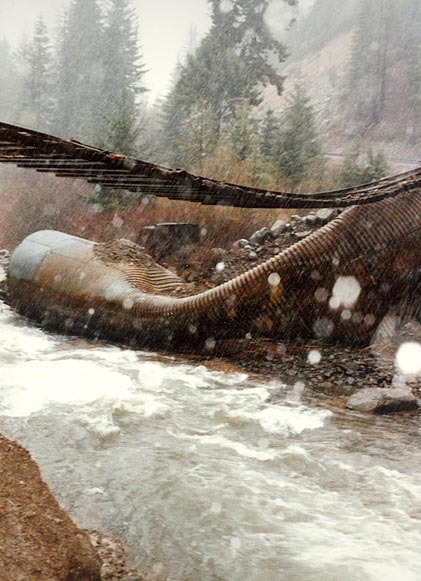 - A 12-foot culvert and fill over the McCloud River near M.P. B-26 washed out. - Bear Creek washed out its culvert and a good section of fill near M.P. B-28. 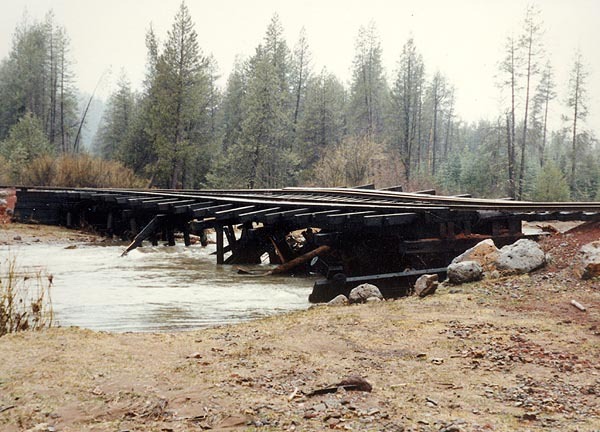 - A few miles farther downstream Bear Creek washed out the Pondosa Branch bridge. - Moose Creek ate away a good part of the roadbed between M.P. B-26 and M.P. B-28. - Many smaller washouts affected the line between Bartle and Pondosa. The railroad commenced repair work immediately. The 12-foot culvert at M.P. B-26 was undamaged, and the railroad built a new fill around it. The railroad had that repair job completed by Friday 21 February. 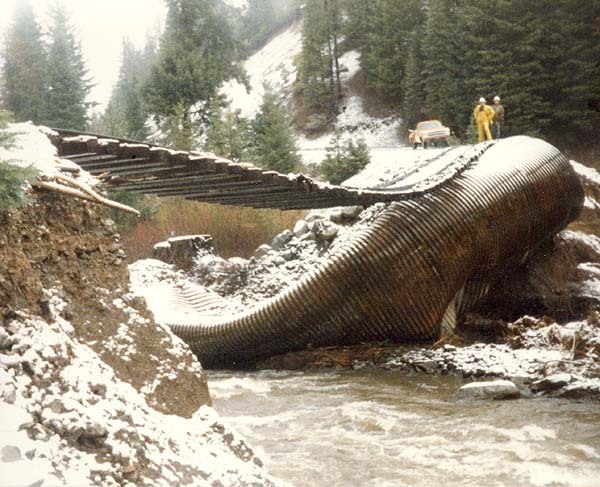 However, the storms destroyed the culvert at the Bear Creek fill, and the railroad had to purchase a replacement culvert pipe. 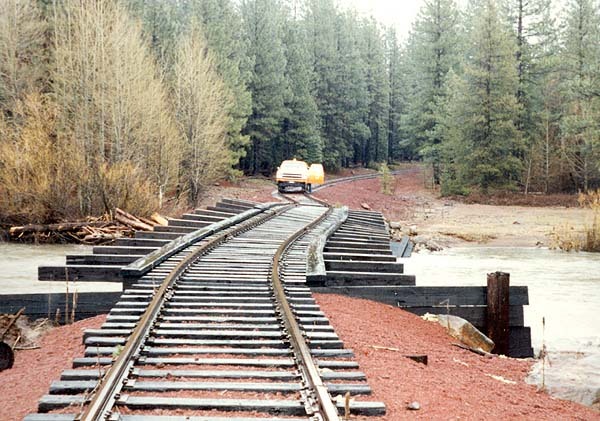 The Burney line remained closed for a month until all repairs were finalized. 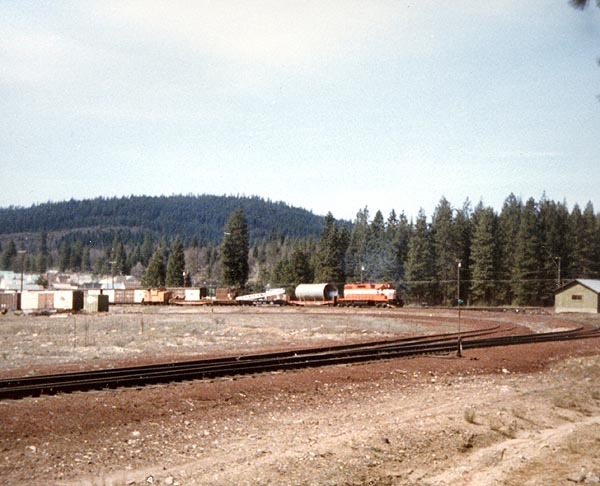 Sierra Pacific Industries established a reload at the old McCloud mill site until the railroad re-opened. 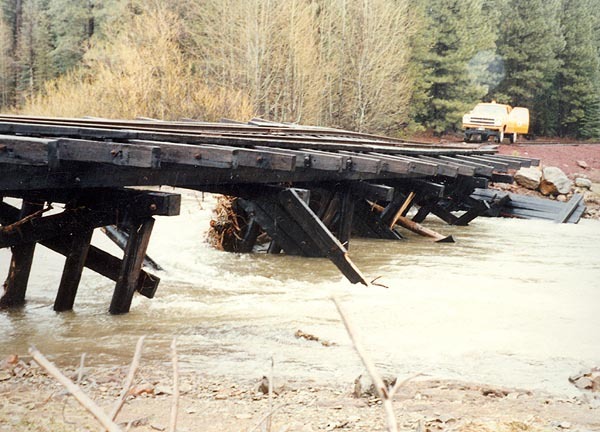 These storms spelled the end of the line for the Pondosa branch, as the railroad did not repair the bridge. Below are some photos of the storm damage and work trains taken by Travis Berryman during the storm repair efforts. All are used with permission. Three views of the washed out Bear Creek Bridge on the Pondosa branch. Two views of the washed out Bear Creek fill near M.P. B-28. The work trains used to repair the flood damage. One of the SD38's with a work train consisting of m-o-w flat #1000, side dump hoppers #1852 and #1860, and another flat carrying the #966 loader. This train appears to have been taken early in the recovery effort. 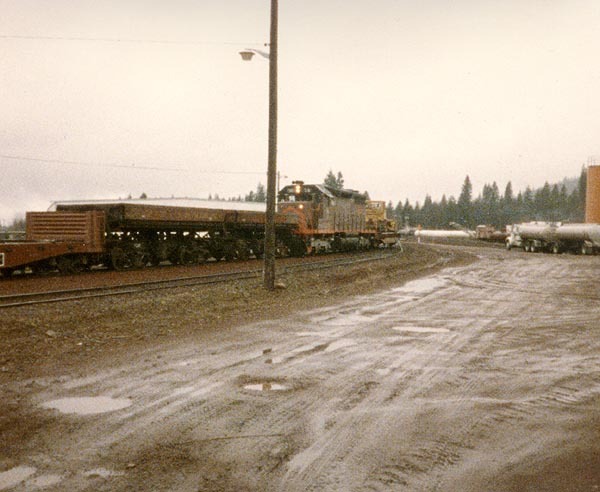 Flat #1000 carrying the new culvert for Bear Creek departing McCloud as part of a work train consisting of locomotive #39, two m-o-w flats, crane #70, and a caboose.